Here at Lollipop our vision is to put our customers and consignors first. Every customer or consignor who walks through our door is considered our partner in business as without "u" there would be no "us". You can expect personalized service every time you come in our store. 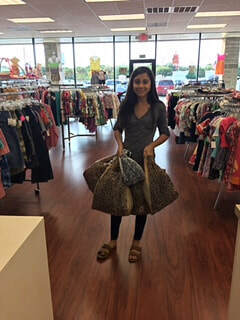 We strive to be the boutique of consignment stores! Since 2010, Lollipop Boutique has over doubled in size due to the fantastic response from the community. We’ve watched so many of our customers grow up over the years, and we can’t wait to watch your little shoppers flourish too. Much like day one, we will make you feel welcome from the moment you walk through our door – we are a large enough store to serve you but small enough to still get to know you by name. All members of our team will be delighted to assist you as you’re browsing our collection of high-quality, hand-picked merchandise. You will find styles for preemies, teens, and everyone in between at our store. Also we carry maternity, baby gear, and TONS of toys too! When looking through our selection of new and just-like-new quality name-brand items, you’ll notice our attention to detail and affordability: It’s the best of both worlds! We just celebrated our 8 year anniversary in April! So many smiling faces over the years! It makes what we do so rewarding! Since our store opened in 2010 we have grown by leaps and bounds! What started as a small consignment store has quickly grown to an amazing store that services Pearland and all surrounding areas! A peek into our store! Inside you will find all clothing by gender, size and color. We are crazy organized. Be sure to check our newest addition! We have added a TrendyXchange section just for Teens and Young Adults! Here you will find all the latest trends for a fraction of the mall retail prices! Check out the TrendyXchange tab for more information.